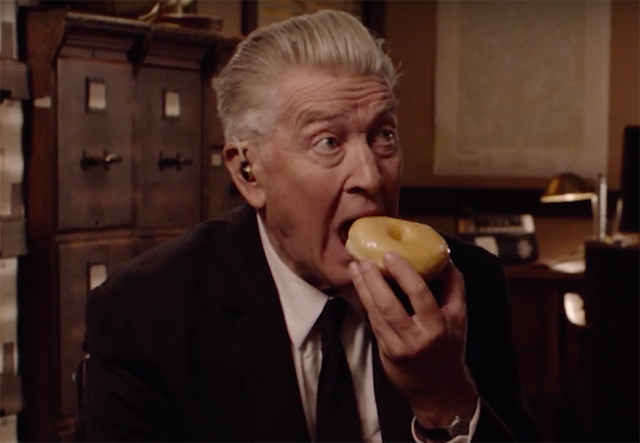 What better way to start your Monday off than watching David Lynch horking down on a big ol’ donut? Showtime has released your first look at Lynch returning as FBI stalwart Gordon Cole in the Twin Peaks revival, which will premiere in 2017 on Showtime, on-air, on demand and over the internet. Check out the hilarious video below! Significant names, both returning and new to the series, include Monica Bellucci, Michael Cera, Richard Chamberlain, David Duchovny, Sky Ferreira, Robert Forster, Ernie Hudson, David Patrick Kelly, David Koechner, Jane Levy, Matthew Lillard, Bérénice Marlohe, Derek Mears, Sara Paxton, Max Perlich, Trent Reznor, Tim Roth, John Savage, Harry Dean Stanton, Ethan Suplee, Russ Tamblyn, Eddie Vedder and Alicia Witt. Previously-confirmed returning cast included Kyle MacLachlan as Dale Cooper, Sherilyn Fenn as Audrey Horne, Sheryl Lee as Laura Palmer, Mädchen Amick as Shelly Johnson, Michael Horse as Deputy Hawk, Dana Ashbrook as Bobby Briggs, Miguel Ferrer as Albert Rosenfeld, Peggy Lipton as Norma Jennings, Everett McGill as Ed Hurley, and Ray Wise and Grace Zabriskie as Leland and Sarah Palmer. Lynch himself will also reportedly be reprising his own role from the original series, returning as FBI Regional Bureau Chief Gordon Cole, along with a cameo from Warren Frost as Dr. Will Hayward. Previously-announced newcomers to the Twin Peaks cast have included Ashley Judd, James Belushi, Larry Clarke, Laura Dern, Balthazar Getty, Grant Goodeve, Caleb Landry Jones, Robert Knepper, Jennifer Jason Leigh, Amanda Seyfried, Tom Sizemore and Naomi Watts.